The start of something grand? This review first appeared in Turbula in June 2010. After writing an apparently stand-alone legal thriller with last year's "Marine One," best-selling author James W. Huston's latest offers up a tale that not only is satisfyingly taut (and disturbingly plausible), but contains an ending that strongly hints this isn't the last we'll hear from these characters. That last part should be considered a Good Thing by readers who enjoy Huston's writing (and there are apparently quite a few of you, to judge by his regular stays on the best-sellers lists). Having him further flesh out these characters, and further explore the real-world issues raised in this novel, ought to result in some fascinating reading for the rest of us. Although be warned: "Falcon Seven" is in many ways as much an argument against the International Criminal Court as it is pure entertainment. The story opens with the two-man crew of a Navy attack jet receiving orders to bomb a secret Taliban meeting place in Pakistan. Shortly after releasing their ordinance, they find themselves shot down by a dozen or so surface-to-air missiles  and then whisked away to The Hague to stand trial for war crimes. It seems the military's information about the target was faulty (or at least incomplete), and the flyers' bomb killed dozens of completely innocent civilians. This is the part of the story where Huston, himself a former Navy fighter jock and currently a corporate attorney speciaziling in aviation liability, starts stoking the reader's indignation: In his novel, as in real life, the United States is not a signatory to the treaty establishing the ICC, and the Obama administration (which plays a prominent role in the book) does not recognize the court's jurisdiction over U.S. military members. Former Navy SEAL Jack Caskey (okay, let's be honest here: Coming up with memorable names for his characters is not Huston's strongest skill set) is now practicing criminal law in Washington, D.C.. He is approached by the White House and asked to defend the two pilots before the ICC. Caskey takes the case knowing that what he does in the court room is only part of the overall equation that will ultimately determine his clients' fate. In order the get the legal resources he needs, Caskey guilt-trips a high-powered and politically left-leaning law firm to provide him a full team for background research, rounding up witnesses, etc. Leading that team is Kristen Chambers  as unapologetically liberal as Caskey is conservative. Oh, and they flirted with the idea of dating while in law school together, and both are currently unattached. Adding an unexpected wrinkle to the story is the fact that as an ex-SEAL, Caskey isn't content to simply prepare his legal briefs. 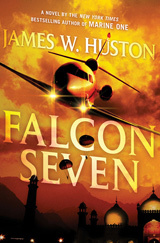 There are as many Tom Clancy moments in "Falcon Seven" as there are John Grisham scenes. Lots of this is predictable thriller fare, but Huston writes with a practiced discipline that keeps the story on track and focused. He gives his characters natural dialogue, and his own outrage over the ICC (which he rails against on his blog at jameswhuston.com) seeps throughout the story. "Falcon Seven" is a top-notch legal and action thriller, one tied (as are most of Huston's novels) to real-world legal issues that give it a palpability that makes it even more resonate. And that ending sure seems to promise more of Caskey and Chambers.